Class distinctions could be profoundly unfair during the Edo era, but sometimes they cut both ways. Cut is indeed the correct operative word in this socially conscious samurai film. A poor but honorable samurai and his faithful servants become increasingly aware of the injustices of the world as the make their way to the capitol in Tomu Uchida’s slightly misleadingly titled Bloody Spear at Mount Fuji, which screens as part of MoMA’s revelatory retrospective of the major Japanese auteur, who remains bizarrely under-screened in the West. Sakawa Kojūrō is a good man and a good samurai, but not when he drinks. Therefore, his servants, Genpachi the lancer and Genta the more conventional manservant are under strict orders to keep him away from the sake. As they travel to Edo to offer tribute to their lord, they fall in with an itinerant shamisen player and her young daughter. The orphaned Jirō also takes a shine to Genpachi. In fact, the first two acts have a vibe weirdly reminiscent of The Canterbury Tales, as Kojūrō and his servants re-encounter many of the same fellow travelers (to use an unfortunate term) at every inn along their route. In this case, familiarity largely breeds respect and affection, especially from the samurai, who will bitterly reproach himself for his inability to aid them in times of tribulation. However, his own egalitarian conduct with his servants will attract the wrong sort of attention from his fellow samurai. 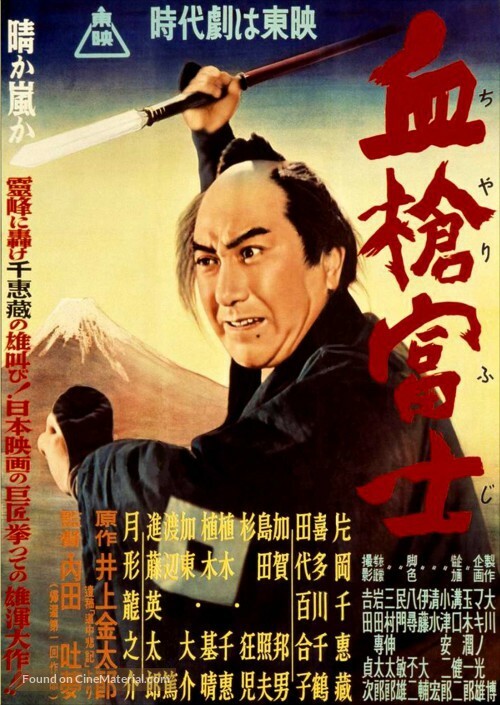 Bloody Spear represented Uchida’s return to the Japanese studio system after spending over a decade making movies in Manchuria, so he had to call in favors with one-time contemporaries Yasujiro Ozu and Hiroshi Shimizu to act as production advisors. In fact, there is an intimacy and a sensitivity to Bloody Spear not unlike that of their domestic dramas. Of course, that spear will eventually get bloody—and when it does, the film gets massively heavy. Resembling today’s Kôji Yakusho, Chiezō Kataoka is all kinds of hardnosed middle-aged steeliness as Genpachi. He has the gravitas and the hack-and-slash chops, but he also develops rather sweetly tender chemistry with Chizuru Kitagawa as the shamisen player and Motoharu Ueki’s Jirō. Daisuke Katō quite effectively counterbalances Kataoka as Genta, who initially seems to be the typical Falstaffian servant but slowly reveals himself to be a considerably deeper, more complex figure. Plus, Ryunsuke Tsukigata really kicks viewers’ legs out from under them as the mysterious Tōzaburō, whose secret really elevates Bloody Spear to the level of high tragedy. 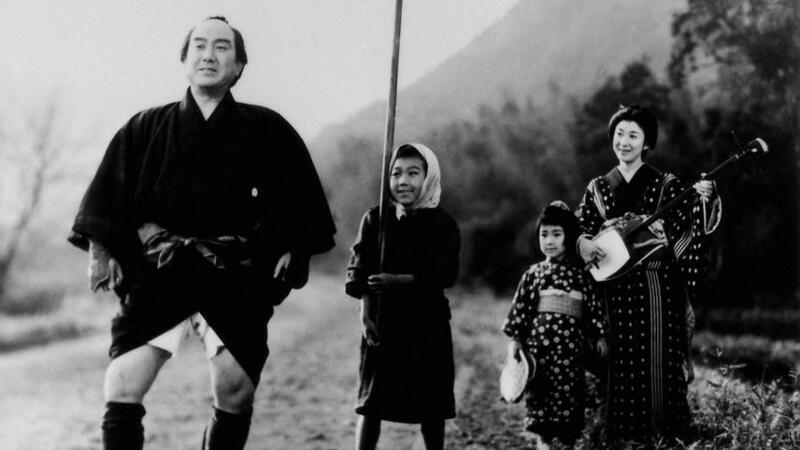 Bloody Spear is just a terrific film that combines the sort of outrage at injustice that marked Reginald Rose’s early work with an affectionate needling of the common folks’ foibles, all within the Jidaigeki format. There is a lot of life happening on the road to Edo—and Uchida takes in quite a bit of it. Very highly recommended for fans of classic cinema of any variety, Bloody Spear at Mount Fuji screens again Thursday (11/3) as part of the Tomu Uchida retrospective now underway at MoMA.